Summary of DDOT’s Ward 1 Projects Meeting | Park View, D.C.
DDOT’s Interim Director, Matthew Brown, answering community questions. 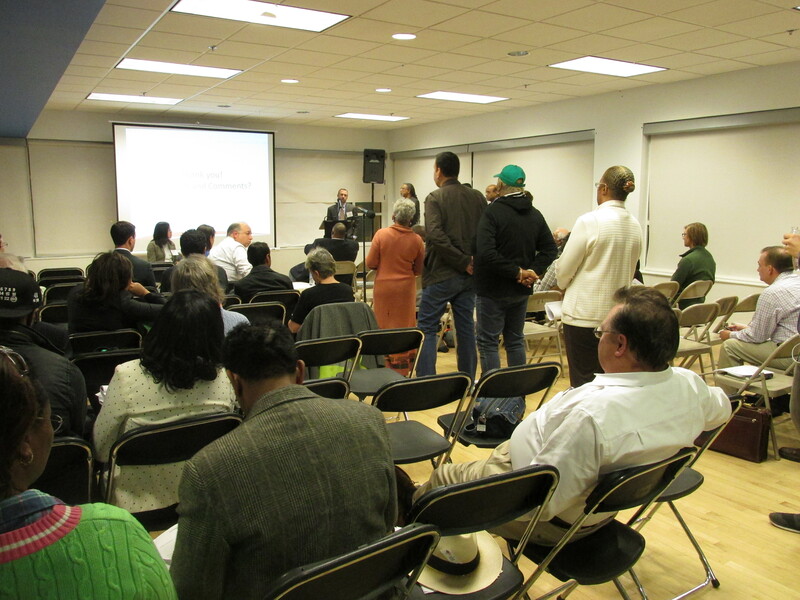 The District Department of Transportation’s (DDOT) Ward 1 Projects Update meeting, held at the Columbia Heights Community Center on October 27, 2014, consisted of a broad rundown of the projects DDOT currently has in the pipeline for Ward 1. With DDOT’s Don Edwards acting as the facilitator, different DDOT staff members got up in turn to speak about their part of the presentation. Community questions were reserved for the end of the presentation. The meeting began with an overview of the Transportation Development Process as a framework for the life cycle of a project. This was followed by an introduction to the goals and status of moveDC, DDOT’s long-term vision plan. The final moveDC document was released on October 21, and those wanting to review it can find both Part 1 and Part 2 available online. For those interested in north-south transportation, DDOT stated that they are undertaking a transit priority planning study for 16th Street, which they hope to have under contract before the year is out, and which will take at least 12 months to complete after they are allowed to proceed. The status of the north-south corridor street car wasn’t discussed in much depth either. It was noted that there were four possible north-south routes identified and that the next phase of the project is the environmental study. No reference was made with regards to funding. The main routes being considered in Ward 1 consist of Georgia Avenue vs. Sherman Avenue. 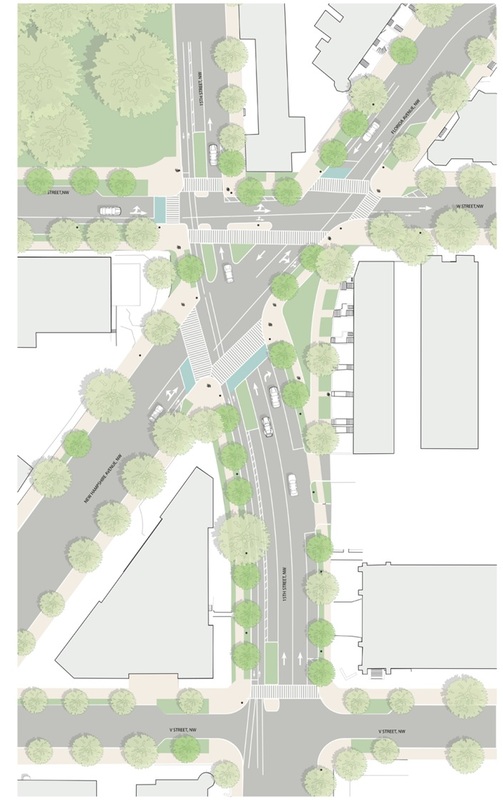 One proposal has the route also on U Street to 14th Street. The improvements to 15th Street will not only make the intersection with Forlida Avenue safer, but also include bioretention bumpouts and the creation of additional greenspace. During the discussion of traffic improvements one that will be of particular interest to residents on Monroe Street, NW, will be the addition of skip lines to the intersection of Monroe and 14th Street, NW. These are planned for the Spring of 2015 and intended to improve the interaction between the two-directional turn movements from Monroe Street — something residents on Monroe Street have been seeking for quite a while now. The presentation on green infrastructure was interesting, where mention was made that more efforts are being made to create tree box spaces that will allow street trees more room to grow by making larger earthen areas under adjoining sidewalks, giving street trees’ roots more room to grow. I was both pleased and disappointed to learn that Ward 1 will only receive 300 new trees this planting season. This is because 97% of the known tree boxes are already planted. However, I pointed out during the later question and answer period that Park View has tree deserts that require long-term planning so that more tree areas can be considered during infrastructure improvement projects such as new sidewalks and bioretention bumpouts. Lastly, in 2015, DDOT will continue their work of bringing sidewalks and crosswalks into ADA compliance. The majority of the Ward 1 crosswalks that will be improved this fiscal year will be along 16th Street between Euclid Street and Spring Road, although I was happy to see that they will be redoing the crosswalk at New Hampshire Avenue and Rock Creek Church Road. For a good sense of what was included in the meeting, I have scanned the presentation materials and made them assessable below. This entry was posted on October 28, 2014 at 9:38 am and is filed under DDOT. You can subscribe via RSS 2.0 feed to this post's comments.